Posts tagged "what’s near jasper"
There are some hidden treasures in the Ozarks. The tiny little town of Kingston, Arkansas is one of them. The town itself is tiny, consisting only of a simple square with a gazebo in the middle for the “downtown” portion and across the bridge heading north there is the school and a gas station. That comprises the “uptown”. Last I knew, the population was around 500. But most of the people live in the hills surrounding Kingston. And in those hills are a lot of crafty and artistic folks! You’ll see evidence of that if you stop in at some of the businesses in town the next time you’re passing through on your way to Ponca or Boxley. What kind of business, you ask? Well, we have antique stores, a cafe, a gas station, a feed store, an old bank still using the old setup (take a look inside it), and an art gallery. I’ve noticed that only the antique stores are said in plural. That’s a dead ‘small town’ giveaway to let you know just how small a town it really is. Kingston Square Arts shop in Kingston, Arkansas. Come out to Kingston to see it all! Prints of paintings by Madison Woods, who makes her own paint from Ozark soil, clay, and stone. Handmade watercolors by Madison Woods of Wild Ozark. Where the Heck is Kingston, Arkansas? You’ll easily find it heading north on Highway 21 from Clarksville, AR (off of I-40) or by heading south on 21 (off of Hwy 412). If you’re heading to Boxley or Ponca, you’ll already be in the vicinity. Hours are 10-6, Thursday through Sunday. Other than in the physical shop, you can find KSA on Facebook and at the website (still working on that). I’m the web and social mistress of the shop, so I’ll often post pictures of the items Greg (the house potter) or Barb (the house fiber artist) is working on or interesting things in there that’s for sale, or new things that the artists and artisans bring in to sell. If you spot anything you want, it’s okay if you’re not close enough to drop in. They ship! Just post on the image in the FB timeline to ask if it’s available and they’ll take it from there. If you’d rather call, the phone number is (479) 665-2559. The address is 100 Public Square, Kingston, AR 72742. If you’re worried you won’t be able to find it, don’t be. 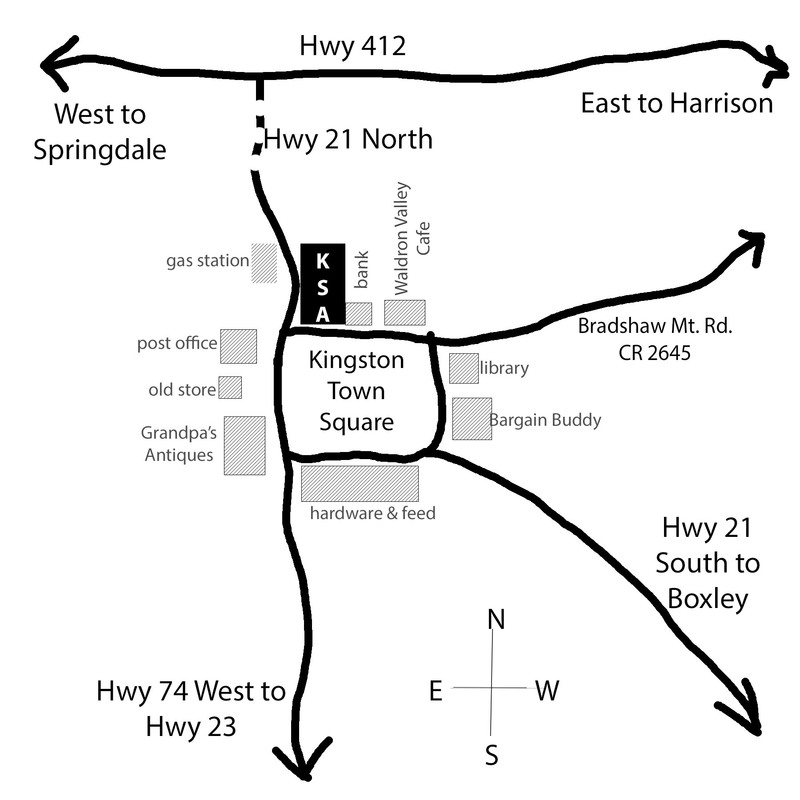 If you can find the town of Kingston, you’ll find the square. And if you can find the square, you’ll definitely find the shop. It’s the big white store on the corner across from the post office. Want to see some other places? Aside from KSA there are other things worth a stop in our tiny town. Maybe the only shop open on Sunday’s, Grandpa’s Antique store is on the square, too. If you have a pot missing a lid, whether cast iron or not, I bet you can find one to fit in Grandpa’s. There’s a lot of antiques and collectibles housed in this historic building, too. The bank is also a historic building. Pretty much all of the buildings on the square are. Inside the bank you can see the old tin ceiling tiles and the old bank vault. Both are in the lobby. There’s also a cafe (Waldron Valley Cafe), Bargain Buddy (antiques) the library (very small by most standards, but much larger than it used to be! ), another antique store, and a new feed store. There’s a gas station just off the square to the north that also serves food. I’ve probably left something out, so if you’re reading this and want to mention another spot to stop in our town of Kingston, Arkansas, or talk about the history of Kingston, just leave a comment and let everyone know!